Various occasions require the subtle beauty of a pop-out card, not many occasions, but when they’re required they are definitely required and there is no substitute for a good pop-out card. In the course I took in 2009 at Kingscliff we did learn about the ancient art of pop-out card making and it’s something I dived into with relish, savoring every carefully folded moment. Yes, I enjoyed it and if I got to spend the rest of my life working for a pop-out card company creating corny pop-out cards for special occasions I would be deliriously happy. 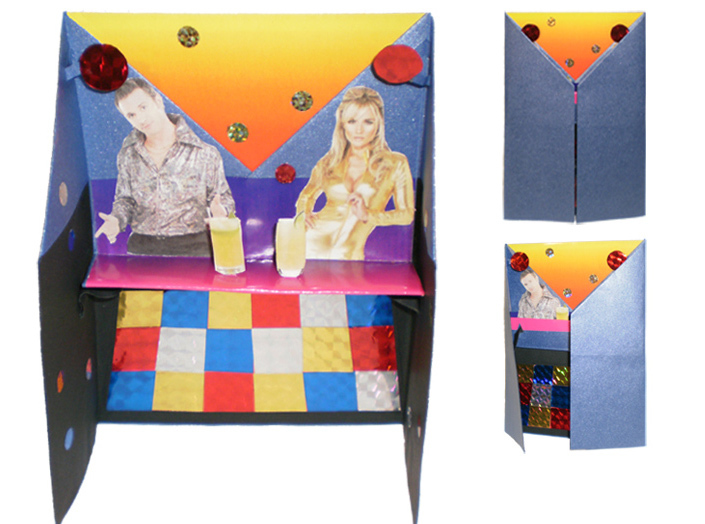 This is a promotional card for a nightclub opening, the top right is the front of the card with plenty of room for the name of the nightclub and any other information, bottom right is the opening and folding down of the bar, the main picture is of the card when it is open, the dance floor and lights are metallic hologram material and the bar folds down as it opens, revealing their unspilt drinks. This is the first one I have ever done and I am quite proud of it, it was for the opening of a new exhibition at a zoo, my zoo was celebrating the birth of a orangutans baby for whom they have created a new enclosure. Top right is the top elevation to give you a clear picture of how 3D it really was with trees and orangutans and even a rope climbing frame. 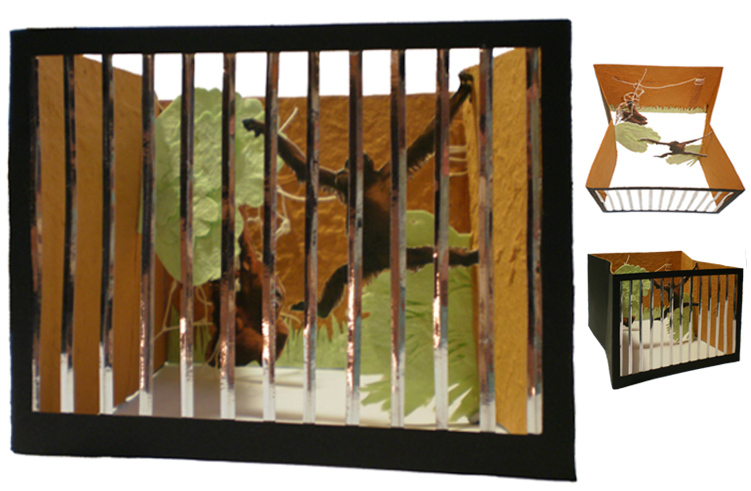 The main picture gives a better view of the orangutans and the steel bars (for safety) the space down the bottom of the card is to make a small plaque with the name of the zoo and exhibit on it. There is clear even space on the back for a worded invitation.